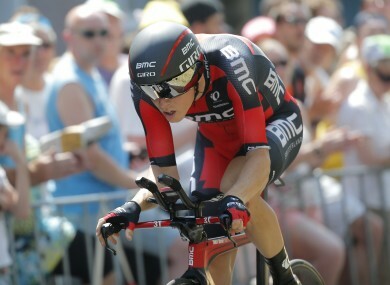 Australia's Rohan Dennis strains during the first stage of the Tour de France cycling race. ROHAN DENNIS SET a blistering pace in the individual time trial to kick the 2015 Tour de France off in style in Utrecht on Saturday but it was a disappointing day for the Irish riders. Dan Martin of the Cannondale-Garmin team finished the stage in 95th position while Team Sky’s Nicolas Roche crossed the line in 101st and Sam Bennett came home 171st. Dennis is first to pull on the yellow jersey this year after he completed the 13.8kilometre stage in 14minutes and 56 seconds, clocking a record average speed of 55.446km/h. The BMC rider’s pace smashed the previous record, set by Chris Boardman in Lille 21 years ago, and put the Australian comfortably clear of the main general classification contenders. Dennis had to wait for the 198-rider field to finish before being crowned stage winner, with Etixx-QuickStep’s Tony Martin going closest to snatching victory away from him. The German looked on course to go fastest, but crossed the line five seconds off Dennis’ time as the heat took its toll. Fabian Cancellara (Trek Factory Racing) took the final podium place as he finished a further second back, while Tom Dumoulin and Jos van Emden completed the top five. Meanwhile, the four men expected to be the main challengers for the yellow jersey in Paris on July 26 all finished within 18 seconds of each other. Defending champion Vincenzo Nibali (Astana) clocked the fastest time of 15 minutes and 39 seconds, with Chris Froome (Team Sky), Alberto Contador (Tinkoff-Saxo) and Nairo Quintana (Movistar) all in close contention. Sunday sees the 198 riders embark on the 166km route from Utrecht to Zélande. Email “No birthday cheer for Nicolas Roche as records broken on opening day of Tour de France ”. Feedback on “No birthday cheer for Nicolas Roche as records broken on opening day of Tour de France ”.